Ben Smith from BuzzFeed recently wrote a post titled, “Why BuzzFeed Doesn’t Do Clickbait” and it generated the responses one would expect. Just take a look at the comments on that post. We’re not clickbait. We’re sharebait! Ben’s argument comes down to how BuzzFeed defines clickbait. According to Ben, clickbait means tricking people into clicking, whereas their goal is to create content that’s share-worthy. If your goal — as is ours at BuzzFeed — is to deliver the reader something so new, funny, revelatory, or delightful that they feel compelled to share it, you have to do work that delivers on the headline’s promise, and more. According to Ben, if because people feel compelled to share their content, it must mean that they’re not clickbait. After all, clickbait = trickery; and people only share content they weren’t tricked into clicking. But they’re not necessarily mutually exclusive. If you follow the Oxford theme and if your content’s main purpose was to encourage clicks, it’s clickbait. Survey/Poll: Are you more X or more Y? How well do you know X? It’s pretty clear that the main purpose of these titles is to encourage users to click into the article. 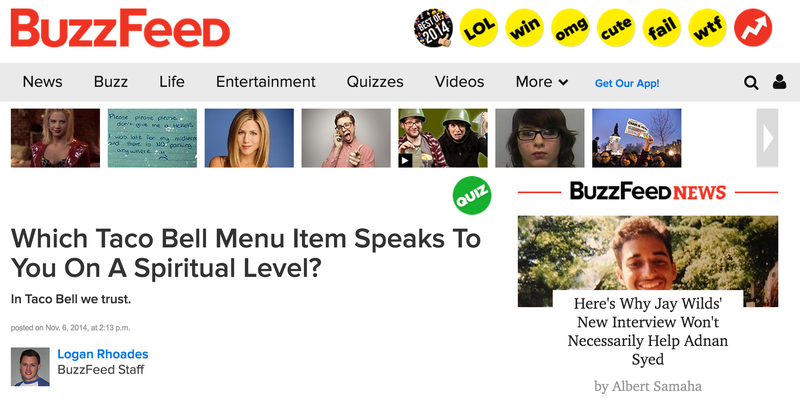 How much of BuzzFeed’s content is clickbait? We did the math. 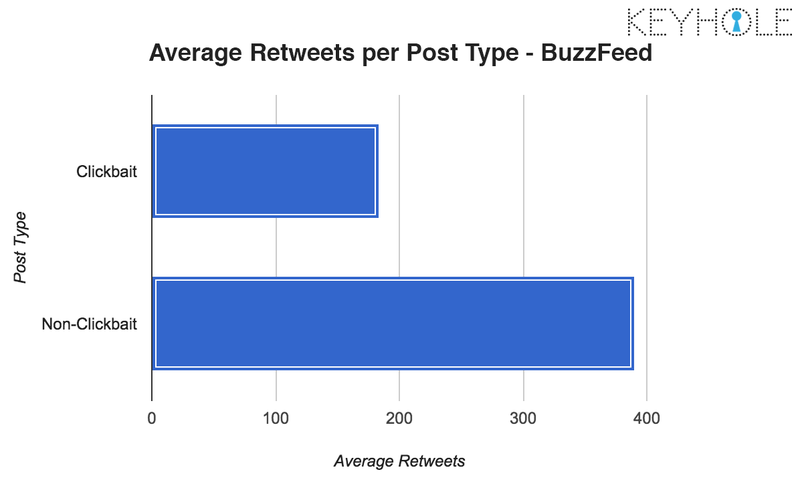 We looked at the last 1,500 posts by @BuzzFeed on Twitter to calculate how many of them were clickbait. You won’t believe what we found! (Actually you won’t be surprised at all). A full 63% of BuzzFeed’s last 1,500 posts were clickbait. In other words, almost 2/3 of their posts had titles that didn’t inform readers directly, but rather encouraged users to click into the article to find the answer. Of those clickbait posts, more than half (55%) were listicles, while another 13.4% were posts that encouraged users to takes quizes, polls and surveys. Ben’s post suggested that BuzzFeed’s main goal was to generate shares from their readers. So, do their clickbait posts actually generate more shares than posts with more informative titles? Surprisingly, posts with clickbait titles didn’t perform as well as informative posts. Clickbait posts generated an average of 183 retweets, less than half the 390 retweets that non-clickbait posts generated on average. This is correlation rather than causation, of course. It shows that informative news-based posts are more likely to be shared than fun-based (or in BuzzFeed’s vocabulary, ‘wtf’) posts. But it doesn’t show whether those same fun-base posts are more shareable with clickbait or non-clickbait titles, which is what BuzzFeed is trying to optimize. And if you define clickbait the same way as the Oxford dictionary, BuzzFeed still engages in a lot of it! Influencer Marketing Basics – What Is It, and Why Care?